I would dare to say that I owned the first copy of this book imported to the USA by Theodore Presser. I forget now exactly how I discovered it was in preparation, but I do remember contacting Naji Hakim directly in order to find out the publication schedule and how to order one. Improvisation method books were (and still are) such a rarity that I was very anxious to see what this modern day master would include in his text. The Improvisation Companion is intended as a reference book for all musicians looking for a form of personal artistic expression on their instrument. While the organ is mentioned, the material is more generally related to aspects of composition (theme, development and forms) than to specific application at the organ. The two appendices cover the basic principles of harmonization and give a repertoire of themes. The title provides a very fitting description of the contents: there are no lessons or assignments here for the student to master. This is a catalog of ideas to explore and implement as the student explores the world of improvisation. One of the most useful sections of this book is the second appendix containing themes. 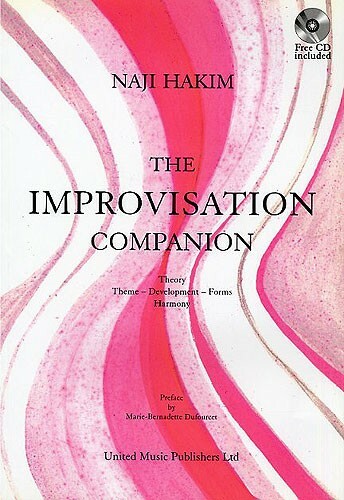 Hakim provides 15 themes for each of six different categories: Traditional songs, chorales, Gregorian chants, free themes, fugues, passacaglias, and literary texts. Another bonus included with the book is a CD of Hakim improvising live in concert at Fourth Presbyterian Church in Chicago, IL. The recording includes a choral partita, Gregorian paraphrase, passacaglia, symphony, and a fantasy on a folkloric tune. Anyone attempting to learn to improvise from this volume would likely find it to be a very difficult art to learn without the aid of a teacher or second text. However, for a student working through another text on improvisation, this proves to be a great resource of ideas and themes. Stuck on how to develop the theme? Try one of Hakim’s suggestions in Part III. Need a theme to work on for your exercise? Look in Appendix II. The Improvisation Companion makes a great secondary volume for a student’s course of study. This entry was posted in Book and tagged Book, Book review, Chicago, Fourth Presbyterian Church, Naji Hakim, Recording. Bookmark the permalink.